Would you love the glow of sun-kissed skin year-round but your skin is paler than snow? You might wonder how you can achieve a tan without burning under the sun or a tanning bed. Fortunately, there are self-tanners that help bronze your skin to give you a beautiful glow! 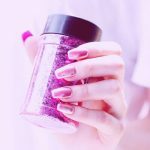 Whether you want to look your best for the summer social scene or just want to change up your appearance, the self-tanners in this list will bring out the best in your skin without the harmful effects of sun rays or a tanning bed! When a product wins an award, you should certainly pay attention! That’s one of the reasons we love the St. Tropez Self Tan Bronzing Mousse! Rated by Elle as one of the best beauty buys, you’ll be sure to love it as much as Elle did! Sometimes, you just don’t have time for a tanning session. That’s why you should look at the St. Tropez Bronzing Mousse. It dries quickly, in most cases under 60 seconds. That means you can apply, let dry, and then head out the door. No need to wait minutes or even hours for the perfect bronzed look. The lightweight formula glides on smoothly and doesn’t leave any heavy residue once it dries. Many tanning lotions emit a less-than-pleasant odor that smells like a tanning salon. You won’t find that with this product. There’s no tell-tale self-tan smell. 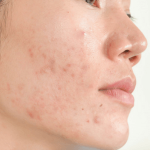 Some tanners might wear unevenly, leaving unsightly blotches or dark spots. The St. Tropez formula dries evenly, giving a long-lasting tan that looks just as great on day one as it does on day five. St. Tropez has really outdone itself with this self-tanner. The lightweight, no-smell formula will surely appeal to pretty much everyone who wants an easy, fast-drying tanner that looks great and doesn’t leave behind any residue. It does not dry out your skin; instead, it hydrates and leaves your skin feeling smooth and soft. Elle truly knows a winner when they see one! This product does run a little more expensive than some other self-tanners in this list. But you certainly can’t beat the quality! 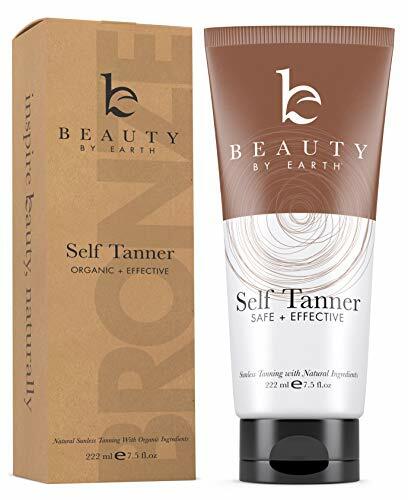 This self-tanner from Beauty by Earth is a tanner which gives you darkened, bronze skin without any sun or chemicals. The formula gradually darkens your skin to give the best skin-kissed glow you’ve ever seen! Amazing ingredients like organic shea butter, organic green tea extract, and organic coconut oil nourish and moisturize your skin while still delivering a gorgeous tan. Don’t worry about this lotion leaving behind unsightly streaks or blemishes. The self-tanner glides on smoothly and leaves your skin feeling fresh and light! If you’re concerned about your tan appearing too dark, don’t worry! Start by applying a light layer of the lotion. For a darker look, apply another layer the following day. Once you get to your desired shade, then you can cease application, so your skin doesn’t get too dark. I love this self-tanner for several reasons. First, the all-natural and organic formula means you’re not putting harmful chemicals onto your body. Your glow comes right from Mother Nature! The tanner goes on streak-free and gradually darkens instead of going on too dark in the first place. It’s important to note that with some skin types, the lotion might make your skin appear orange (I have pale skin, but it looked great on mine). Try testing the self-tanner on a small patch of skin before applying to your whole body. This will make it easier to determine if this product is right for you! Finding a good-smelling, long-lasting self-tanner can often prove to be difficult. I recently came across the Tanceuticals self-tanner, however, and little did I know it’d become one of my favorites! The light coconut fragrance smells heavenly! I feel like I’m at a beach instead of smelling like I just stepped out of a tanning bed. It’s such a light and fresh fragrance! Some tanners only manage to last three to four days on average. This self-tanner lasts up to a week! It’s perfect if you’re going away on vacation and you don’t want to concern yourself with having to apply this every day! Self-tanners have a tendency to run and can rub off on clothing or bedsheets. Not this one! The self-tanner stays on your skin and goes nowhere else. If for any reason you do not love this product, Tanceuticals will refund your money. There’s no risk involved with using this self-tanner! I absolutely love this product for its smell and for how long it lasts. Not many other self-tanners smell as great or last up to a week. Additionally, the formula stays on your skin, not on your bedsheets. It’s easy to apply and doesn’t leave any residual streaks or disgusting orange color. All you get is a lovely bronze tan! Whereas some self-tanners are mousse or foam, this formula comes in lotion form. Some might say it has a runny consistency, making it a bit more difficult to apply. 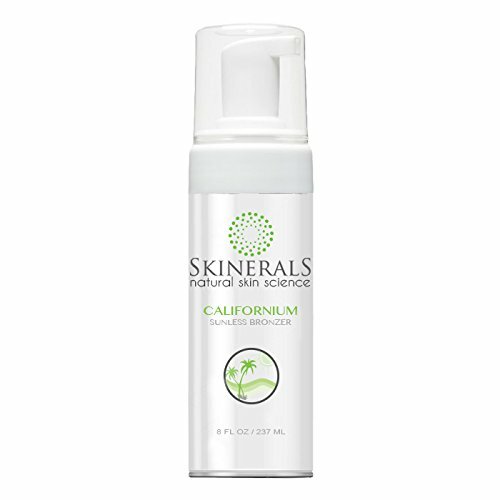 Skinerals Self-Tanner is another fantastic product for helping your skin look touched by the sun! Incorporating natural and organic ingredients, this brand uses minerals and not chemicals to accomplish a stunning look for your skin! Everyone likes a safe, feel-good formula, right? Skinerals created this tanner with humans and animals both in mind. The formula boasts no sulfates or parabens, and they also do not test on animals. You can both look good and feel good for using this product! This light formula keeps your skin looking healthy and feeling soft. Have oily skin? Dry skin? Sensitive skin? No problem! Skinerals self-tanner works well on all skin types. You won’t have to worry about irritated or scratchy skin as a result of this product! This product contains between 4-8 full body applications, depending on usage. Each application lasts approximately 4-7 days. You don’t need to concern yourself with applying every day! The Skinerals self-tanner is an extremely impressive entry in this list. Not only does it leave your skin feeling soft and smooth, but it also lasts quite a while and gives your skin a sun-kissed glow without harming your delicate skin. Ingredients such as lavender oil, shea butter, and orange peel oil make this a safe, gentle product for your skin, and it works for just about all skin types! It has been noted that it can streak or rub off on clothes. I recommend applying just a little bit prior to doing a full body application to check the effects. A good self-tanner does more than just bronze your skin. It should also take care of it! 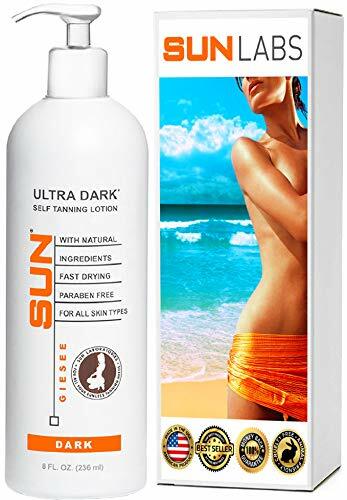 This great sunless tanning lotion by Sun Laboratories does just that! Not only does it make your skin glow, even if you have pale or fair skin, it also nourishes and hydrates to keep your skin looking its best! This self-tanner really does it all! It helps to give you a natural, flawless tan, but it also nourishes, hydrates, revitalizes and enhances your skin. It brings out the natural beauty of your fantastic skin! You don’t need to go out into the sun to glow beautifully! Simply apply this lotion to your skin to achieve a stunning look with no negative side effects! Parabens are synthetic preservatives found in cosmetics, shampoo, conditioner, and other beauty products. 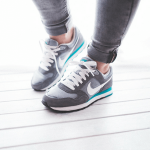 They are associated with some types of health problems, so it’s wise to avoid them as much as possible. Sun Laboratories does not use paraben in their self-tanner, so rest assured this product is safe! Sun Laboratories really knows how to create an effective and safe self-tanner. This bronzer not only gives you a natural-looking tan with no adverse side effects, the paraben-free formula means you don’t need to worry about any of the nasty chemicals found in some cosmetics. It also keeps your skin looking healthy, rejuvenated, and hydrated. This product is advertised as very dark. Some have found that this tanner gives them a more subtle tan than a darker one. For budget-conscious self-tanners, you’ll love this product. It’s inexpensive, but it still delivers a great tan when compared to some of the more expensive options. Sometimes self-tanners come out of the bottle as greasy and sticky liquids that can make a mess as you apply it to your skin. Fake Bake’s formula doesn’t stick to your skin. Are you concerned about not being able to tell where you apply the product as you use it? Fear not! This product includes a color guide so you can see where you’re applying it. Some tanning products smell like chemicals once you’ve used them. Not this product! Fake Bake’s self-tanner gives off a tropical scent which reminds one of a lovely summer breeze. Fake Bake’s unique formula works with your skin to enhance the skin pigments, so you receive a more natural-looking tan. It doesn’t matter what your skin tone or type is, this product will work for you! This is a great budget-friendly self-tanner for just about anyone! It works with any skin type and tone. It also smells great, not leaving a lingering chemical scent other tanners give off. The color guide helps indicate where you’ve applied the product, so you come out with an even, natural tan. The non-sticky formula goes on easily and stays on. The tan from this product takes longer to develop, upwards of 4-6 hours. Some have also mentioned it peels after a few days. What Is the Best Self-Tanner for Pale Skin? 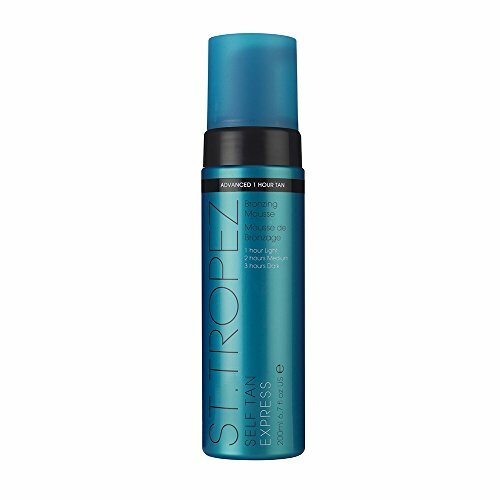 My favorite self-tanner for pale skin is the St. Tropez Self Tan Express. The St.Tropez formula is lightweight, long-lasting and super easy to apply. Additionally, it works for all skin types and leaves your skin feeling smooth and soft. It lasts for a long time (It lasted on my skin for more than a week) and does not leave any streaks. Sunless tanners work by temporarily darkening the cells on the skin’s surface through the ingredient dihydroxyacetone (DHA). The effect lasts a few days at most before the product needs to be applied again. Something to keep in mind is that most self-tanners do not contain sunscreen and therefore will not protect you from the sun’s harmful UV rays. It’s important always to use sunscreen when you’re out in the sun. Self-tanners come in liquid, mousse, spray, or foam form. Each essentially function the same though some might prefer the feel and consistency of one over another. How Long Do Self-Tanners Last? Self-tanners rarely last longer than a week. On average, the tan will remain for 3-4 Days, although there are some high-quality self-tanners that can last for a week or more. During that time, it’s important to reapply the self-tanner if you’d like to keep your glow going for longer. How to Remove Spray Tan? How Do You Apply Self-Tanner Without Streaks? Applying self-tanner without receiving those obnoxious streaks is a little bit of a process. It’s perfectly okay if you don’t apply a self-tanner correctly the first time! Heck, the first few times I used a self-tanner I ended up with streaks! But, as they say, practice makes perfect! Follow the steps below, and I have no doubt you’ll be a pro in no time! 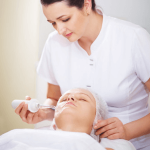 Exfoliation means removing the dead cells on the surface of your skin. You can use any number of products to do so. Afterwards, also use an AHA or BHA exfoliant. Repeat the exfoliation process every day until you use the self-tanner. Shave the day before you begin the application process as well as right before. This also helps to exfoliate your skin and eliminates the chance of self-tanner accumulating in your hair follicles. Apply cream or lotion to those places on the skin where dead cells accumulate (think your ankles, elbows, knees, and feet) and on dry skin. Moisturizing prior to applying self-tanner ensures that the product absorbs evenly and lessens the chance of spots and blotches. It’s best to start from the bottom of your body when applying self-tanner. Place a small amount of product on a tanning mitt (I don’t recommend using your bare hands) and then start at your ankles and feet, slowly working your way up to your arms and hands at the end. Working from bottom to top prevents any marks or lines from bending over or other movement as you work. Most self-tanners take a little bit of time to dry and a few hours for the final color to develop. It’s important to take the time to let the self-tanner do its thing. This way you’re sure to leave behind no streaks or uneven tanning. You can also take this time to correct any mistakes or add more as needed. It’s important to keep exfoliating throughout the life of your tan. Some parts of your body will fade quicker than others due to sweat and the clothes you wear. Exfoliating helps keep this process even. I can’t stress the importance of wearing sunscreen. As mentioned above, most self-tanners do not contain any sunscreen, so it’s up to you to protect your skin. Use a high-grade sunscreen to prevent any sun damage. At the end of the day, you want to keep your skin healthy, and sunscreen is the best way to do so. In this article, I shared some of my favorite self-tanners. 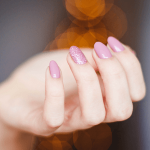 Whether it’s the middle of winter and you want a tan or if you’re hoping to start your summer look in spring, a self-tanner can be a safe and easy way to get glowing, natural-looking, sun-kissed skin. Some products are certainly better than others, and I’ve highlighted a few of my favorites. You really cannot go wrong with any of the choices in this list! Lastly, I shared my secrets for securing a streakless tan with just a few easy steps. Again, your first time may not be perfect, but I have no doubt that with practice, you’ll become an expert! I hope you found our Best Self Tanner for Pale Skin article useful. Do you want us to review any other self-tanning mouse or lotion? Do you have any other questions about any other Self Tanner?